•	Familiar typewriter key locations and legends. •	Positive tactile feedback. Each production element, from printed circuit boards to keytops is generated inhouse to insure high quality. So ask your computer dealer for a hands-on demonstration of a Key Tronic keyboard. Call Toll Free 1-800-262-6006 for the retailer closest to you. (7am – 3pm Pacific Time). Warranty information may be obtained by writing to the address below. KB 5151 and 5151 jr —The Professional Series. KB 5151 is plug-compatible with the IBM * PC and XT. KB 5151 jr is plug-compatible with the IBM PCjr* Both are available in DVORAK and foreign layouts, and special models are made for the handicapped. Plug-compatible with Apple II, and models are available for the handicapped. KB 5150 and 5150 jr —The Profession!! Series KB 5150 is plug-compatible with the IBM* PC and XT. KB 5150 jr. is plug-compatible with the IBM PC jr.* Both are available in DVORAK and foreign layouts, and a special model is made for the handicapped. Department E • P.O. Box 14687 • Spokane, WA 99214 (U.S.A.) – (509) 928-8000 *IBM and PC jr. are registered trademarks of IBM Corporation. *Apple II is a registered trademark of Apple Computer, Inc.
*DEC VT-100 is a registered trademark of Digital Equipment Corporation. *Televideo-925 is a registered trademark of Televideo Systems, Inc.
*Radio Shack is a registered trademark of Tandy Corporation. I used a lot of Televideo terminals, and bought literally hundreds. One reason we liked them was their keyboards. My favorite was the TV970 – it had an integrated wrist rest that doubled as a “coffee reservoir” – if you spilled something on the keys it would flow down into the front of the keyboard, away from the electronic parts. We’d flush them out with water (unplugged, of course) afterwards. 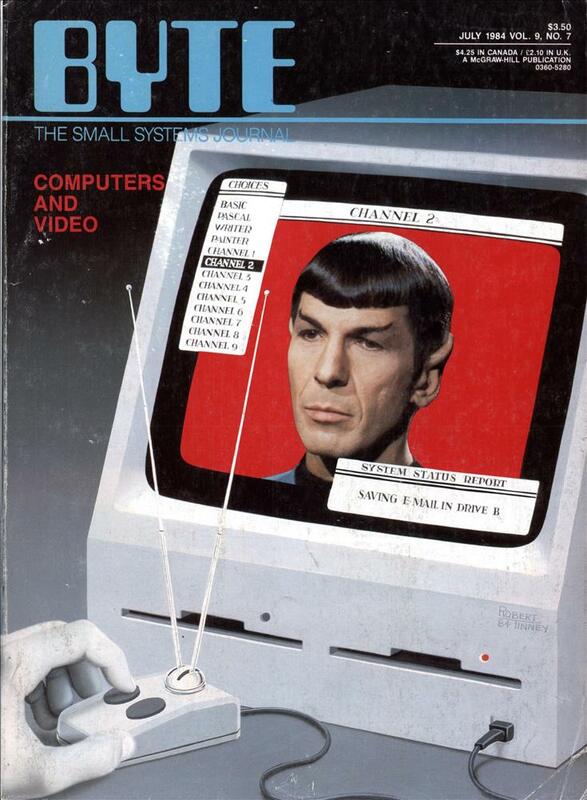 The TVI terminals of the 925 era were quite compact – perhaps they were selling the extra narrow keyboard to save space out front. 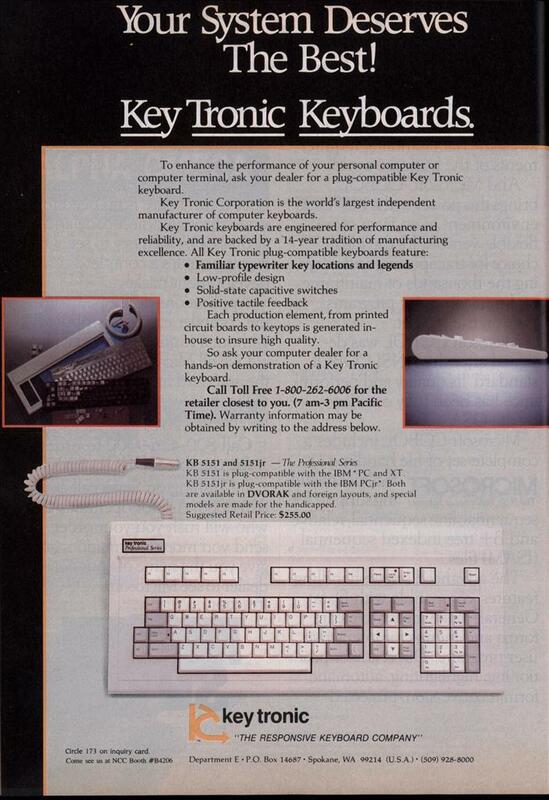 My first PC, an XT clone, had a KeyTronic keyboard that cost me $99 CDN. I spent extra for this keyboard, because it had the same layout as the 101-key Model M from IBM, as opposed to the more common cheap clone keyboards of that time which had an AT-like layout, where the backspace key was in the wrong position. So I have positive things to say about KeyTronic – although today, I would send people to Unicomp instead. $716 is not unrealistic for a keyboard. That’s just below $7 per key. That’s not unrealistic for a good key.